Getting engaged is more than just having a ring on your finger—it’s an occasion that expresses commitment and a desire to create a future with the love of your life. However, as exciting as that moment is, couples will have to start planning for the wedding shortly after, and doing so involves many moving parts. While these celebrations come in all shapes and sizes, below are a few of the most important aspects you’ll need to start addressing and how to organize them. The average wedding engagement in America is about 14 months. Set the date a few months after the proposal to enjoy a brief celebratory period before the planning. Give yourselves a year to make all the necessary arrangements. Knowing the number of attendees will help determine how big the ceremony and reception venue should be, as well as provide a jumping-off point for budget calculations. Promptly after making the guest list, send attendees their “Save the Date” cards. The sooner you lock down a location, the better—especially if you’re getting married during prime wedding season. If you have guests coming from out-of-town, consider booking a block of local hotel rooms at the same time. Start tastings so you can decide what the guests will eat and who will provide the food. This is also a good time to arrange for the wedding cake, in case a preferred vendor doesn’t offer both. Although there’s a little bit more flexibility with tuxedo orders, brides will want to decide on a dress about nine months before the event. This will give you enough time to make adjustments for the perfect fit. Send formal invitations anywhere from six to 10 weeks out to the event, with an RSVP deadline three weeks before the wedding. This window will give guests enough time to make arrangements. Once you approach the weeks leading up to the wedding, start getting floral arrangements and other decorations in order. You’ll also want to make sure you have an officiant, DJ, and photographer booked by this point. 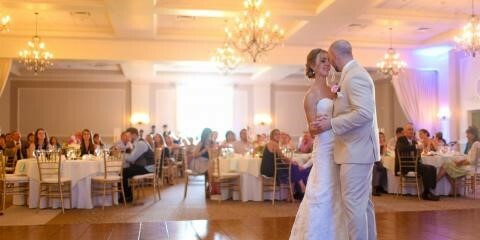 If you’re planning a wedding in Cumberland County, there’s no better venue to choose than Eastlyn Golf Course & The Greenview Inn. Nestled on a picturesque golf course in Vineland, NJ, this local spot is perfect for both outdoor and indoor celebrations of all sizes. Beyond providing a beautiful setting, the facility is also equipped to cater, offering an impressive selection of fine dining options prepared on site. Call (856) 691-5558 Ext. 3 to start the reservation process.